After rescheduling Santiago’s abdominal ultrasound 4 times (no exaggerations made), I decided to call my former counselor. It became clear to me that all my copying mechanisms were failing in lifting my sadness and that anger and desperation were building up rapidly. I also realized that my husband was more concerned about my well being at this point than Santiago’s and that was not fear to him. In my first session, I talked for at least 45 minutes without taking a breath and then I cried, I cried a lot! The first big realization I had was that I was going through a grieving process regardless nobody was dead. I was grieving that “the way I always imagined having my baby” was not going to happen for me. 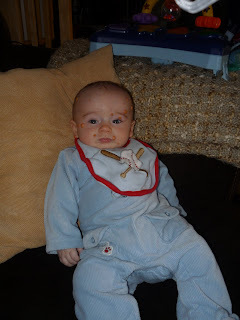 When I walked into a room, people would not come to me to tell me how beautiful my baby was (most of them wouldn’t) and my biggest concern raising a baby would not be his teething pains or an ear infection. Dr. Kubler-Ross identifies 5 stages of grief and I definitely walked through all of them:1) Denial: despite the fact that I was told twice by different doctors that Santi seemed to have JXG, I did not believe it until the biopsy results came. Even then, I still thought that his case would not be severe against her dermatologist’s warning. For a long time I would skip going to the histiocytic websites because those diseases were really bad and my Santi’s was not. 2) Anger: to say that I was mad is an understatement, I was furious. I was angry at God, at myself, at my husband, at my family and at the whole world if you asked me. Why was this happening to my little angel? Why us? It is estimated that 500 kids are diagnosed each year in the US with some type of histiocytic disorder. The chances are almost as tiny as to win a lottery, a very bad one and yet we got the winning ticket! 3) Bargaining: I started to negotiate with God. I asked him to take the JXG away from Santiago and give it to me instead. I also offered him to give me any other type of disease he wanted if JXG was not of his preference. I started to pray to Saint Expedito, a Saint that helps in urgent causes (I still did not want to believe that JXG came to stay for a long time). I used to pray three times a day, sometimes four. I knew I was not praying, I was telling God what to do. 4) Depression: when I realized that God and Saint Expedito were not doing what I asked, after I was mad to almost all my family members and friends, and I had several fights with my husband, I gave up. I felt completely powerless over JXG. It was obvious to me that there was nothing I could do about the spots besides watching them grow. I felt that I was failing Santiago as a mom. I had a horrible sense of loneliness. Nobody seemed to completely understand what I was going through, not even my husband. Close ones either tried to minimize my feelings, wanted me to be “positive” or they seemed to be in a worse place than I was. 5) Acceptance: when my counselor suggested that I should try loving Santi’s bumps since they were part of his body, I thought she went crazy. When she said that she was concerned that I did not want to come out of my house and wanted me to join a “mommy class”, I thought she was insane. When she pointed out that Santi and I were more “normal” than not, I thought: “that is because you don’t know how people look at us” and when she kept repeating that I was a smart and loving person and she knew that I was going to figure this out with time, I could not visualize it either. However, the fact that she could was already making me feel better. *My eternal thankfulness to Marilyn, who have helped me work the most difficult issues in my life and have always listened to my truth without judgment.